(from DaimlerChrysler Press Release) February 2, 2004 - The Dodge Ram SRT-10 unleashed its Viper power today, taking its place in the Guinness Book of World Records as the "World's Fastest Production Pickup Truck." It ain’t bragging if you can do it. 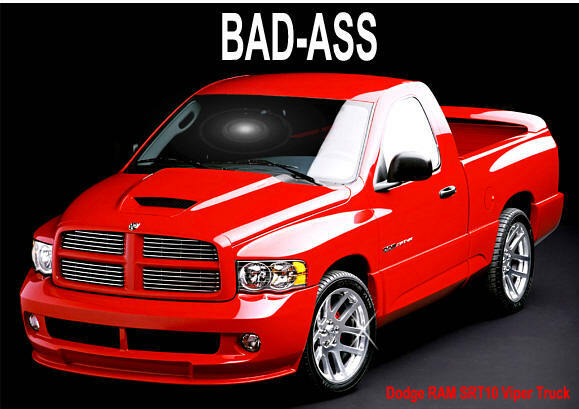 With a maximum speed of 150 mph and the biggest engine in a performance pickup, the Dodge Ram SRT-10 backs up its claim as the baddest truck on the block. The Ram SRT-10 makes the most of its 500 horsepower Viper engine with a combination of high technology, performance icons and some old-fashioned hot-rodding. More than just a big engine, Ram SRT-10 adds the largest standard wheels, tires and brakes offered on a production pickup. Unique in a world of look-alike trucks, the Ram SRT-10 is a radical, custom-built performance truck, straight from a manufacturer. 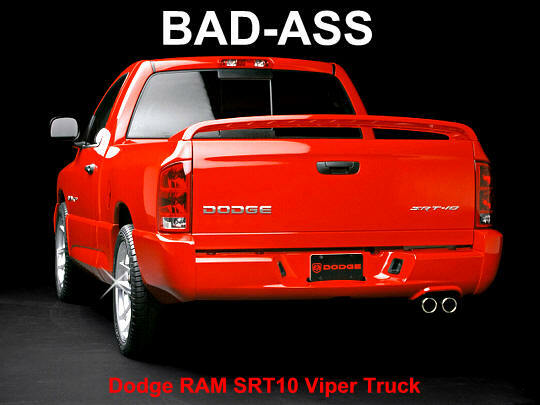 The Dodge Ram SRT-10 blends performance cues direct from the Dodge Viper SRT-10, the ultimate sports car and the baddest pickup on the market, the Dodge Ram. From the beginning, the engineers at PVO knew that this monster truck was a snake. The 8.3-liter Viper V-10 delivers 500 horsepower and 525 lb.-ft. of torque. Resting on unique engine mounts; the V-10 engine delivers 90 percent of its whopping 525 lb.-ft. of torque from 1500 to 5600 rpm. The cast aluminum cylinder block has interference-fit cast-iron liners and cross-bolted main caps. The Ram SRT-10 also features a unique oil pan, throttle linkage, new “Hi-Flow” exhaust manifolds, new transmission mounts and a modified Ram Heavy Duty radiator tailored to fit the between the NASCAR inspired grille baffles. The rest of the V-10 is straight from the Viper, with a six main bearing crankshaft with cross-bolted main bearing caps. Despite larger diameter aluminum alloy pistons than the previous generation’s 8.0-liter Viper engine, the pistons weigh less and are included along with all-new, lighter and stronger cracked-steel connecting rods. Cylinder heads on the Viper V-10 are semi-permanent mold (SPM) 356 T6 aluminum alloy. Low-profile die-cast magnesium cylinder head covers feature steel internal baffles and anti-slosh foam. cooling system is modified to handle the needs of the new Viper engine. A custom dual exhaust system is mounted to new exhaust manifolds. The 2004 Dodge Ram SRT-10 focuses its power through a new, purpose built Hurst shifter and a modified version of the Viper SRT-10’s Tremec T56 six-speed manual transmission. The T56 is fully synchronized with electronic reverse lockout. A new 4.5-inch aluminum driveshaft runs from the Viper-sourced transmission to a Dana 60 rear axle with a 4.11 ratio to deliver the massive torque to the road. Despite rocket-like straight line acceleration, the Ram SRT-10 was also designed to carve corners and challenge the laws of physics. The engineers at PVO modified the rack and pinion steering system from a Dodge Ram Heavy Duty and custom tuned the independent front suspension. Working with the hydro-formed Dodge Ram 1500 frame, one of the stiffest in the industry, PVO dropped the Ram SRT-10 one-inch in the front and 2.5-inches in the rear. New front and rear strut assemblies and a rear sway bar were added to handle the increased cornering loads and virtually eliminate body-roll. To make the most of the excellent handling characteristics of the Dodge Ram 1500, the PVO engineers added Bilstein mono-tube shock absorbers, a new front knuckle design and shorter and stiffer performance tuned springs. Next came unique aerodynamic aids to keep the Ram SRT-10 planted at high speeds and 22-inch custom “Viper-style” wheels fitted with 305/40 R22 Pirelli Scorpion tires for extra adhesion. The rear leaf springs were modified and leaf spring snubbers were added for smoother power launches. To ensure that the Ram SRT-10 makes the most of its 525 lb.-ft. of torque, PVO designed a unique power hop damper to stop axle hop under full acceleration runs. A Bilstein shock absorber was fitted between the frame and axle, and now clean launches, even on slicks, are just a right foot away. Big brakes, another Dodge Ram staple, are also modified for the 2004 Ram SRT-10. The standard ABS-equipped brakes are fitted with new 15-inch rotors on the front brakes. Rear brakes are modified Ram Heavy Duty with 14-inch rotors. Front and rear brakes feature unique red calipers. The new front fascia features NASCAR-inspired brake cooling ducts to provide plenty of cooling for track sessions.